Successfully Added Self-Service Fingerprint Time Attendance - 4 Inch TFT Screen, 1000 Fingerprint Capacity to your Shopping Cart. 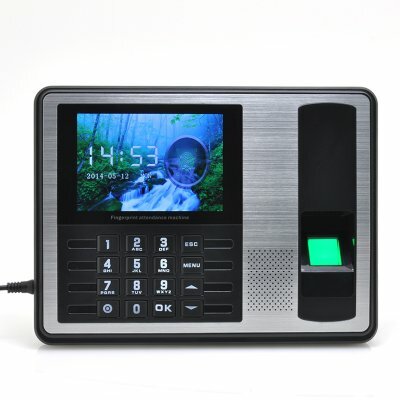 Self-Service Fingerprint Time Attendance allows you to keep track of who is here as it has a 4 Inch TFT Screen and a 1000 Fingerprint Capacity. This fingerprint time attendance system uses biometric reorganization to register each employee that clocks in and out has been designed to help manage employees and employers manage attendance record. There is a 4 inch TFT display, which a biometric fingerprint scanner to allow employees to clock in easily plus they can also enter a password. The advantages of this system are huge as it eliminates the need of name cards and paper work as everything is stored on the system itself. It takes less than a second for the system to recognize the employee’s fingerprint and then the employee will know exactly their clocked in time. Just one system could easily be implemented to maintain and monitor the records of a whole factory plus office staff as it has a fingerprint capacity of 1000. The entire collection of information and records can be downloaded by means of a USB flash drive as this system has a built-in USB port making it simple for managers and HR staff to keep track of the records. This product is in stock now, we guarantee next working day shipping and offer a 12 months warranty on all our products. Brought to you by the leader in electronic devices and wholesale Fingerprint Devices, Chinavasion.